Ms. Celiac Says...: Gluten Free Corn Pasta! I know some of you on a gluten free diet prefer rice pasta while there are others who only eat corn pasta. I've written in the past about some of the best brands of rice pasta, so I thought I should take the time to mention a great brand of corn pasta. Sam Mills recently sent me a box of their tasty corn pasta. Not only is it gluten free but it is low in fat, GMO free, cholesterol free, egg free, soy free, dairy free, and kosher! And one of the best things about this pasta is that it retails for only $1.99 for a 1lb. bag! That is much, much, much cheaper than most gluten free pasta! 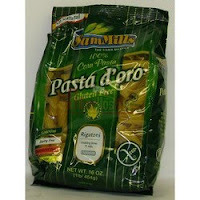 For more information on Sam Mills USA Gluten Free Corn Pasta, please visit www.sammills.eu! You may also purchase Sam Mills pasta at Ms. Celiac's Market!